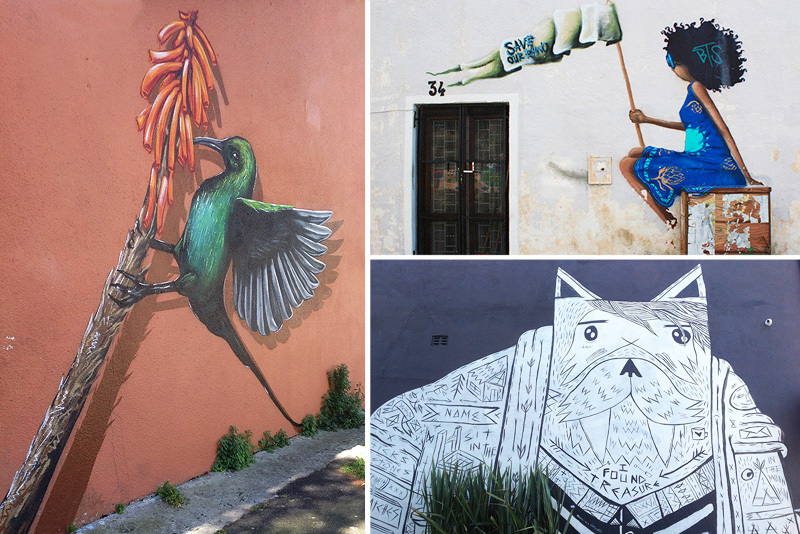 The vibey heart of Cape Town is filled with plenty of interesting places and people and it’s best explored on foot as every side road and backstreet tells a story. 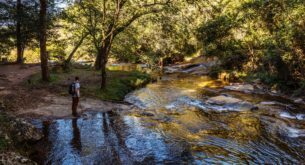 Here are some of the main things to do in Woodstock to get you started! 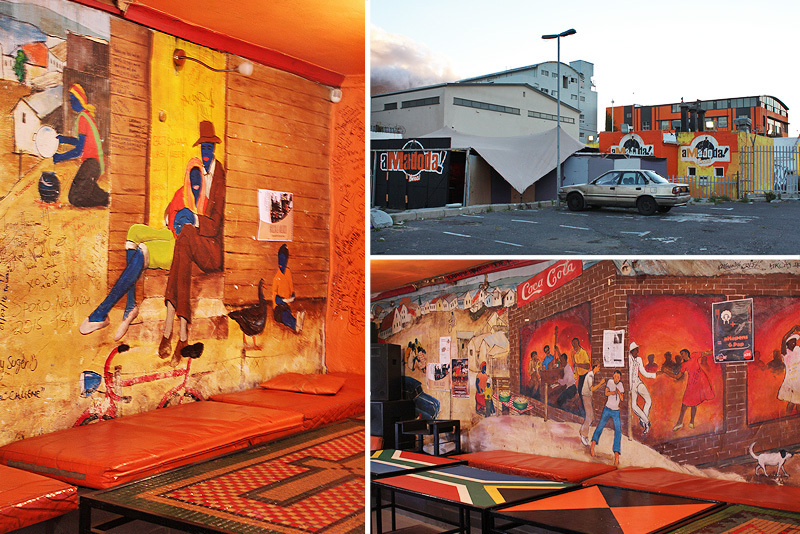 The colourful neighbourhood of Woodstock originally began with a few fishermen’s houses and farm cottages, situated two kilometres east of Cape Town, on what became Albert Road. It has been through many phases, but today Woodstock is undergoing an urban renewal with many new buildings and businesses, making it a hip and happening neighbourhood. Woodstock is filled with plenty of interesting places and people and it’s best explored on foot as every side road and backstreet tells a story. However, here are some of the main attractions to get you started! 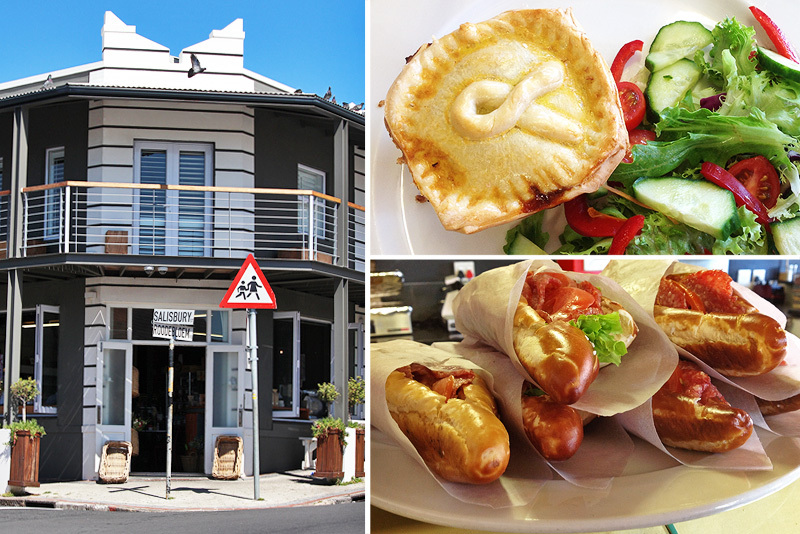 Roodebloem Road has many restaurants and bars, but if you are looking for great breakfast or lunch spot, then Salisbury’s is the place to go. Their prices are so good that I when I re-visited them I asked if they still had their R50 lunch specials – turns out they have never had lunch specials, they just have good prices (and most of their menu items are still about R50). You can also buy deli goods, craft beer, wine and take-aways if you don’t feel like cooking dinner. Seating is limited, but if you go slightly out of the breakfast and lunch rush hours, you should find a spot to enjoy a latte. I highly recommend their pies and wraps! While you are there, take a look across the road – the Parkers Superette (orginally S. E. Parker General Provision Grocer) is one of the original stores in area and has been in the same family for four generations. Go buy a chocolate or a coke and support a local family! Salisbury’s is a good spot to start the day with their reasonably priced breakfasts and lunches. 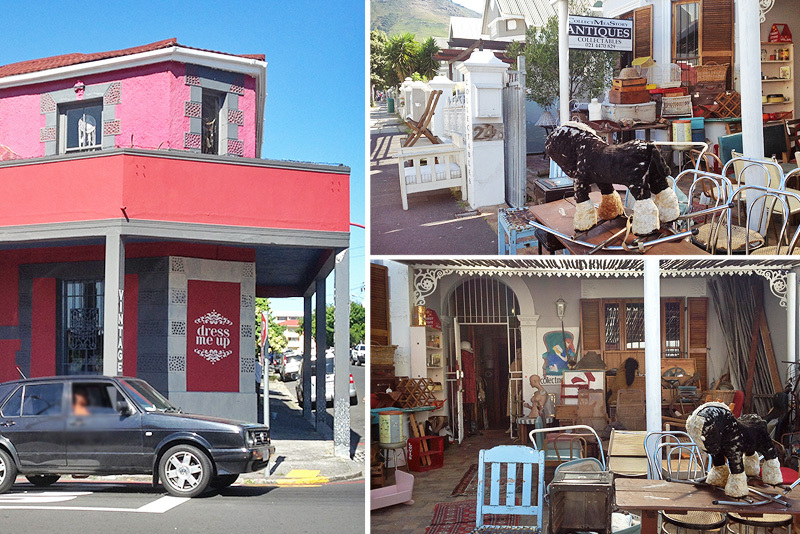 Roodebloem Road also has a few vintage and antique shops tucked in-between the burger joints and craft beer spots. Dress Me Up on Salisbury Road (opposite Salisbury’s) is stuffed to the brim with vintage and retro clothing and a few Sally Louw ceramic pieces. You’ll also find a small selection of interesting vinyls! Collect Me A Story further down Roodebloem Road has all sorts of paraphernalia to snoop through from furniture to shop dummies, books, tins and toys. 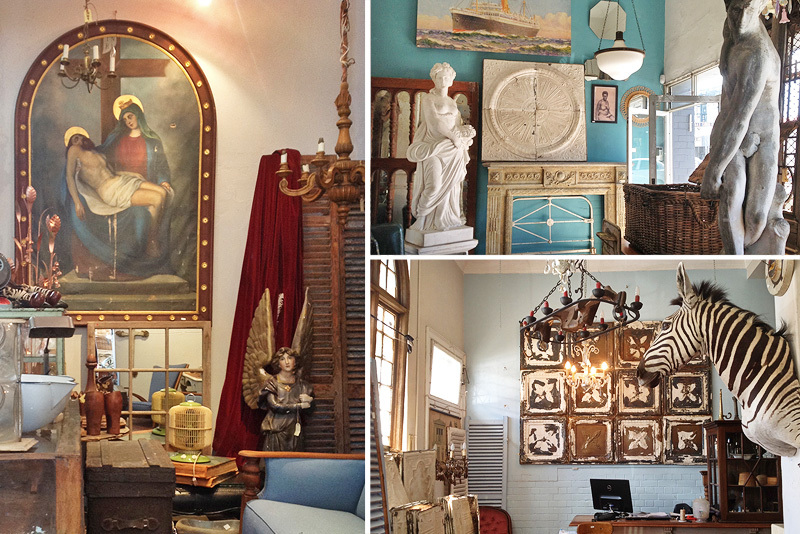 It’s the sort of place where you never know what you may find and where every item has a story! The rooftop with a view of the Mother City at Jamaica Me Crazy is the best spot to be at this much-loved and popular Caribbean-style spot – unless it’s windy! The food is good and reasonably priced, but they are famous for their great cocktails and even better happy hours. 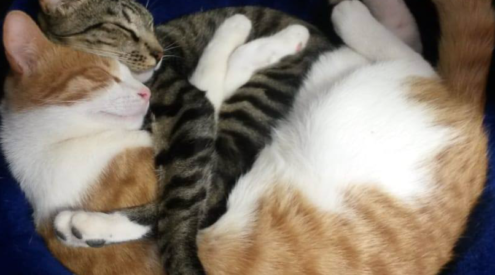 They have Monday specials, a pub quiz night on Tuesdays and host various other events on a fairly regular basis. 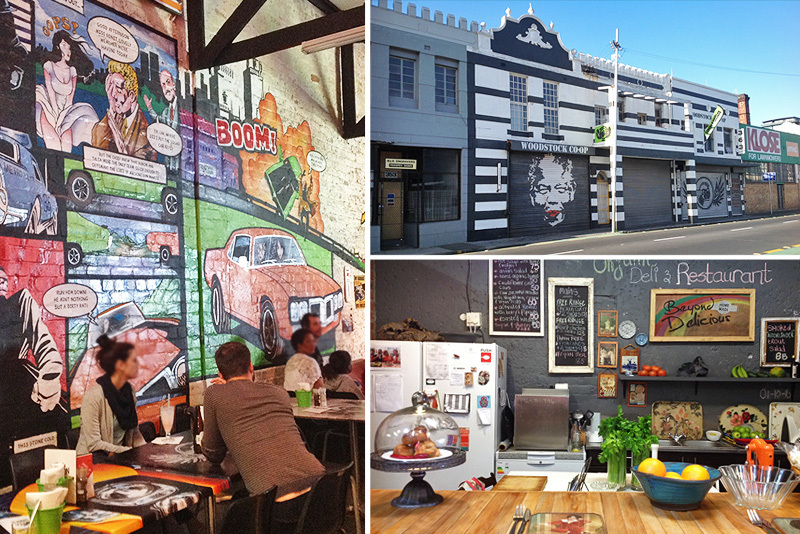 From a Saturday market to games and galleries, restaurants, local crafts and designer stores, you’ll find a lot to keep you entertained at The Old Biscuit Mill. 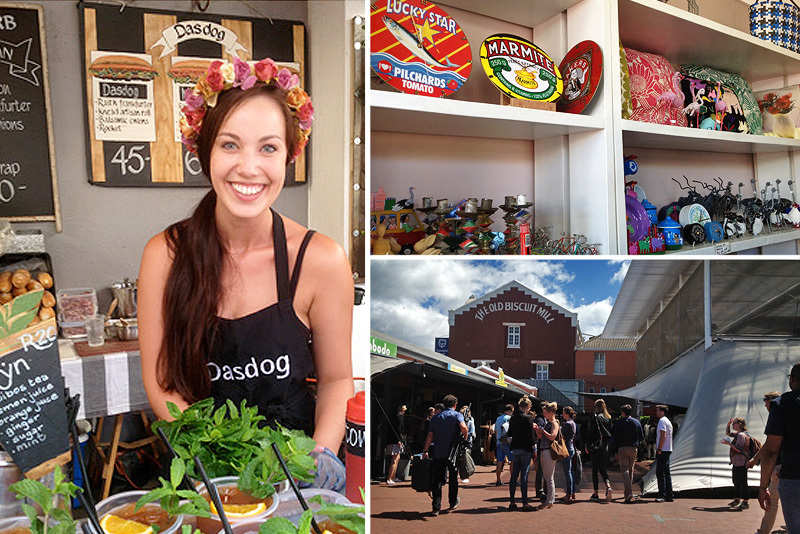 Having become quite a Woodstock tourist attraction, it’s one of those places that you either love or loathe, especially on Saturdays when every visitor to Cape Town flocks to the Neighbourgoods Market. If you are going to go to the market I would suggest you go early! 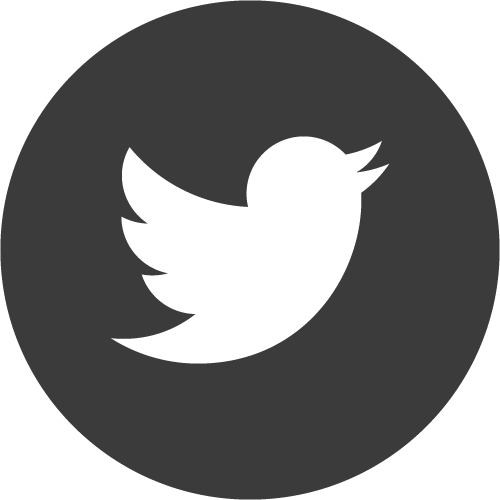 Otherwise I would recommend you visit on another day so you have plenty of space to look around the many interesting shops and galleries and grab a bite to eat without being jostled and getting frazzled. 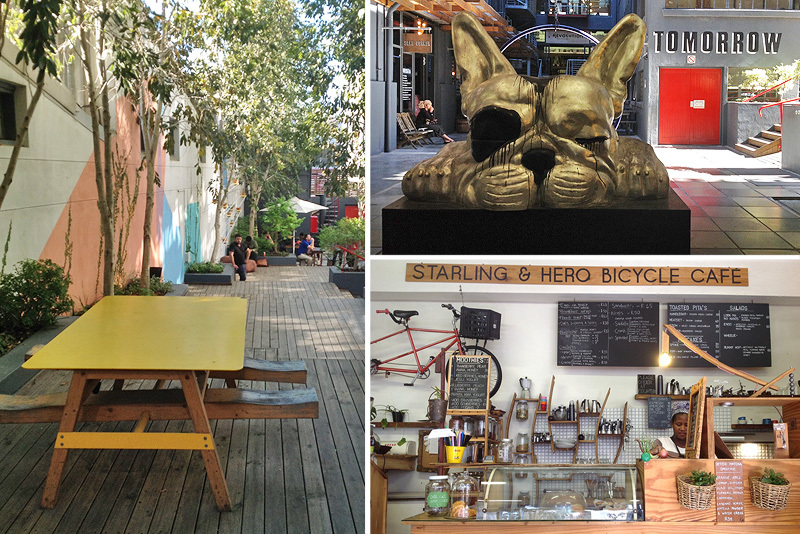 A market, trinkets, art galleries and plenty of people can be found at The Old Biscuit Mill. 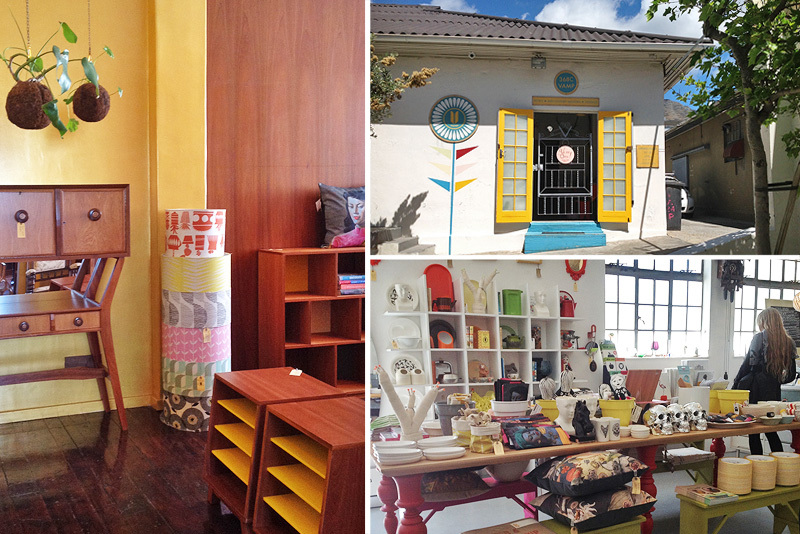 Not far from The Old Biscuit Mill and close to the Salt River Circle you’ll find ReCreate, a little shop filled with all sorts of clever things! Owner, Katie Thompson, salvages items that are no longer required for their original purpose and turns them into something else. Suitcases get upholstered to be chairs, bottle tops become beer mats, vintage golf clubs make excellent towel rails and keys from computer keyboards are turned into fridge magnets. 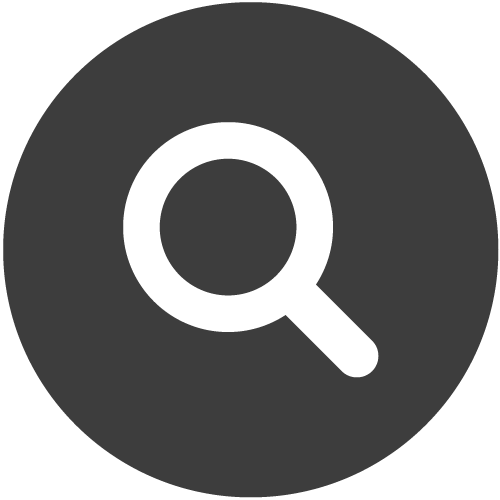 You’ll be amazed at what has been created from what may be considered old and useless! 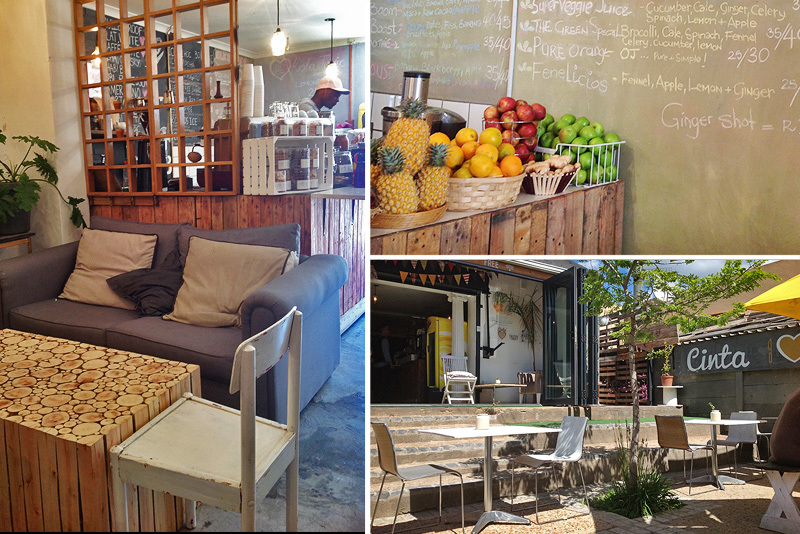 You can also enjoy a cup of Deluxe Coffee while you browse through up-cycled furniture and vintage Koeksister cutters. 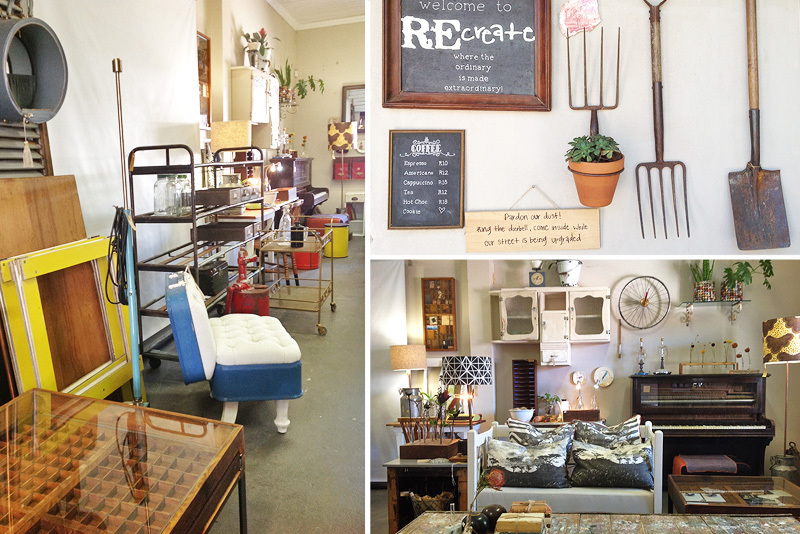 Deluxe coffee and up-cycled goods at RECreate. When you settle into the relaxed atmosphere at Casa Nostra Bar, you’ll find it hard to leave! Outdoors has seating with a street view, while inside you’ll find comfy couches and a bar with a built-in chess set. 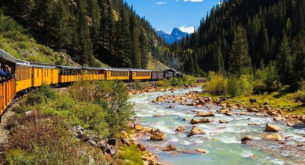 The owner and staff are incredibly friendly with an “our house is your house” attitude and their reasonably-priced meals are prepared before your eyes on an outdoor grill by a fairly entertaining chef. Although I don’t suggest you make this your first stop in Woodstock as you’ll suddenly find the day has gone – especially if you get stuck into the giant Jenga! The relaxed atmosphere at Casa Nostra Bar may cause you never to leave. You are going to have a tough time choosing what to eat at the Cinta Food Market! However, I can heartily recommend the potato and fennel samoosas from The Little Bo-Kaap Kitchen – although she almost had me doing a toss up between the tomato bredie and the banana fried with Masala spices. You’ll also find Thai Street Food, a juice bar, coffee and Mexican fare. Cinta means love in Malay and if you love wholesome home-cooked food, then you’ll definitely fall in love love this little foodie spot. It’s a good option for vegetarians too as there are many meat-free options. Wholesome food made with love at Cinta Food Market. You’ll find something you never knew you needed at Vamp Furniture. 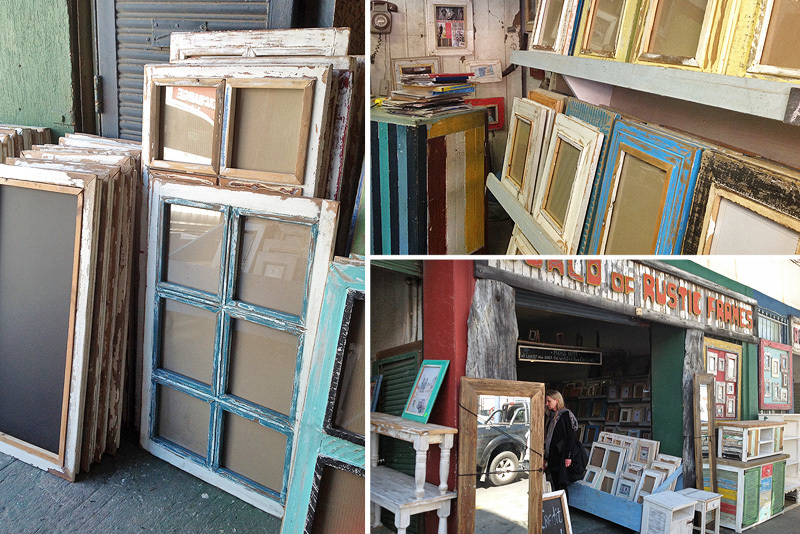 Just up the road from the Old Biscuit Mill is World of Rustic Frames, where piles of old wooden window frames and whitewashed benches flow out of the shop and onto the street. Old window frames make for interesting photo frames, but if you prefer a good old-fashioned frame crafted from aged wood, then this is the place to go as they have a mind-boggling range, all made from recycled wood. They also make furniture to your specifications. Everything at Rustic Frames is created from recycled wood. Woodstock is certainly brimming with antiques and second-hand goods, but there’s something a little different about Wauhaus. It has more upmarket items, but also has a sort of unsettling feel! I put it down to the fact that many of the items in there are from churches, so prepare to be stared at by angels while stepping past copper baths and under chandeliers. 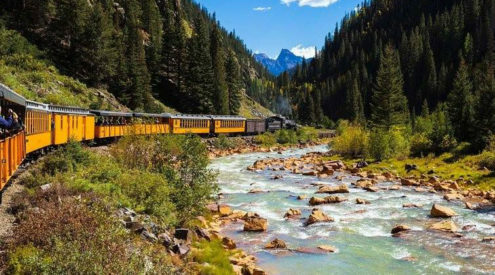 It’s a fascinating place and one where everything is guaranteed have an interesting history! All the items in Wauhaus are guaranteed to have an interesting history. A maze of creative spaces including an antique shop, a gift shop with recycled products, an organic deli, a coffee shop, a tattoo parlour and a burger joint stroke diner all make up what is The Woodstock Co-Op. Inside, All Women Recycling makes gift boxes out of plastic bottles, Phoenix Moon has beautifully crafted furniture and some quirky art pieces, Captain Kirwin’s Coffee has latte’s and espresso’s (and a charming “caffeine dealer”) and the Three Feathers Diner has impressive wall murals, classic car collection and burgers. It’s the sort of place where you could get lost for hours, which is a good thing as you will be supporting local entrepreneurs. A maze of creative spaces and eating spots at the Woodstock Co-Op. Craft beer breweries are all the rage and you’ll find a few in Woodstock where you can enjoy a cold one, along with a meal. Devil’s Peak Brewing Company, situated in an impressive building that you can’t miss on Cecil Road, just off the Main Road. 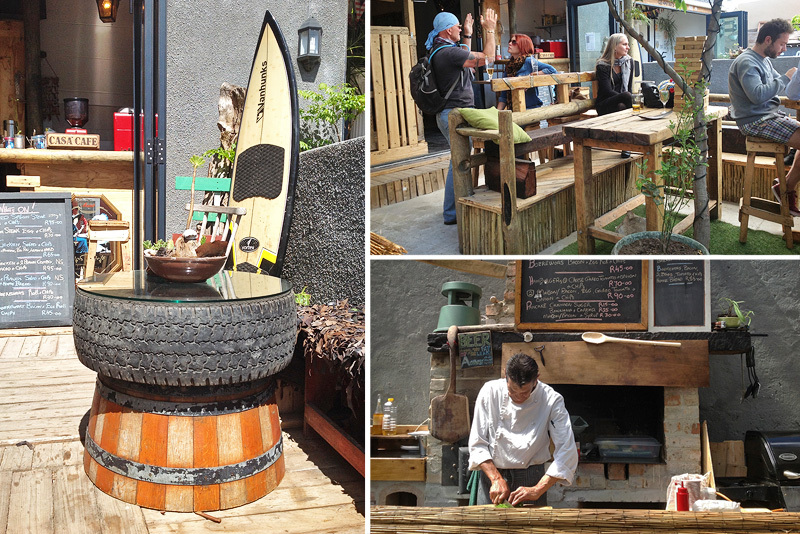 Apart from the great views, they have a great burger special on Tuesdays, Saturdays and Sundays where you can get a cheeseburger (there’s also a vegetarian patty option) served with a side of fries and a half pint of one of their lagers or a carafe of their wine for R55. They also have a daily happy hour, half-price menu on Mondays and a beer and wing special on Wednesdays. 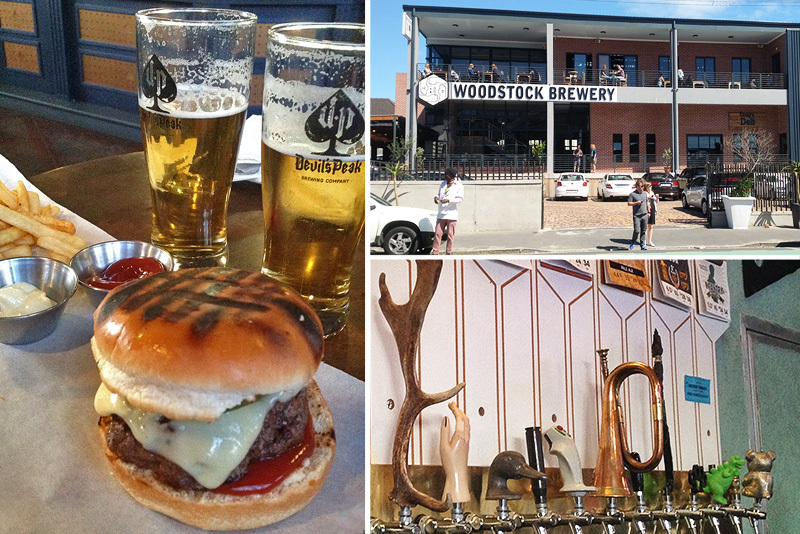 Woodstock Brewery in Albert Street also has some great daily specials in their Woodstock Grill & Tap, including two-for-one burgers for R80 on Mondays, while on Saturdays you can get a one litre jug of beer with a choice of mini burgers, calamari, bitterballen, vegetable spring rolls or biltong for R80. A good option for a Saturday celebration with friends! For something a little different, pop into the Brewer’s Co-Op, also on Albert Road. Apart from craft beers and ciders at a very reasonable price (starting at R20 a pint), an interesting ceiling design and quirky faucet handles, they have a unique concept in that they provide the space and machinery for their members to make beer and then sell it on the premises. That means you can never tell which beers will be on offer at any given time, but you are generally guaranteed to have 16 different ones to choose from. Plus they have quiz nights every Wednesday night along with various other social events. Clockwise from left: burger special at Devil’s Peak Brewing Company; Woodstock Brewing Company has a grillroom and deli; interesting faucet handles at Brewers Co-Op. There are are no knives and no forks at aMadoda Braai in Strand Street (off Albert Road) – just a hand bowl to wash your hands. Now that’s a braai! 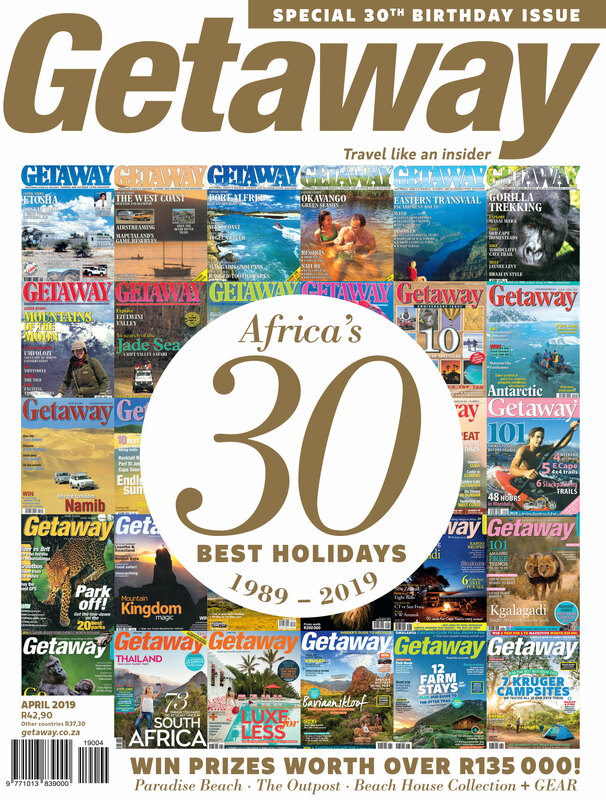 Choose from De Quickie, an Ama Chow Chow, De Big Mix or De Feast and tuck into braai’d chicken drumsticks, pork chops, boerewors, Xhosa bread and Amachakalak salad served on tin plates. If you want to cook yourself, you can buy a braai pack that has heaps of meat and includes a braai grid, hot coals and secret spice. The giant mural depicting township life makes for a great backdrop to long tables designed for sharing, plus there’s with a pool and foosball table. While it’s something that’s a little different to the usual Woodstock eateries, it is slightly off the main drag and in a fairly quiet backstreet, so probably a good idea not to linger too late into the night. 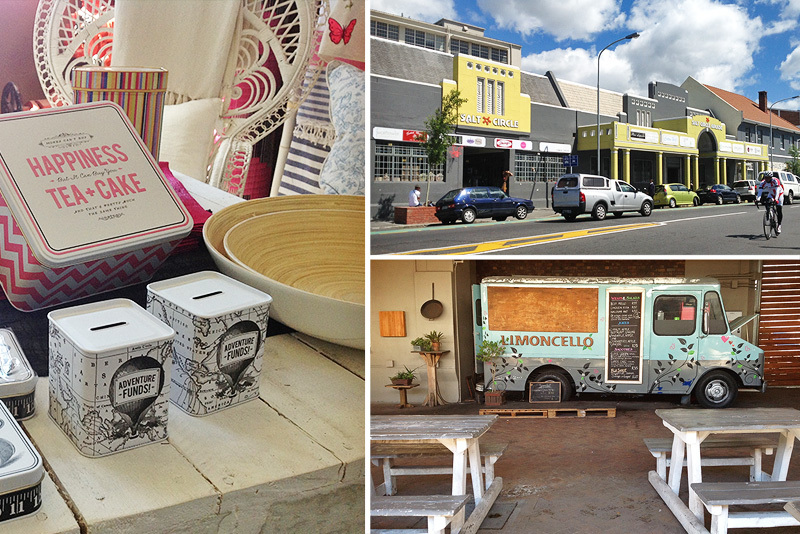 aMadoda Braai brings township braai vibes to Woodstock. 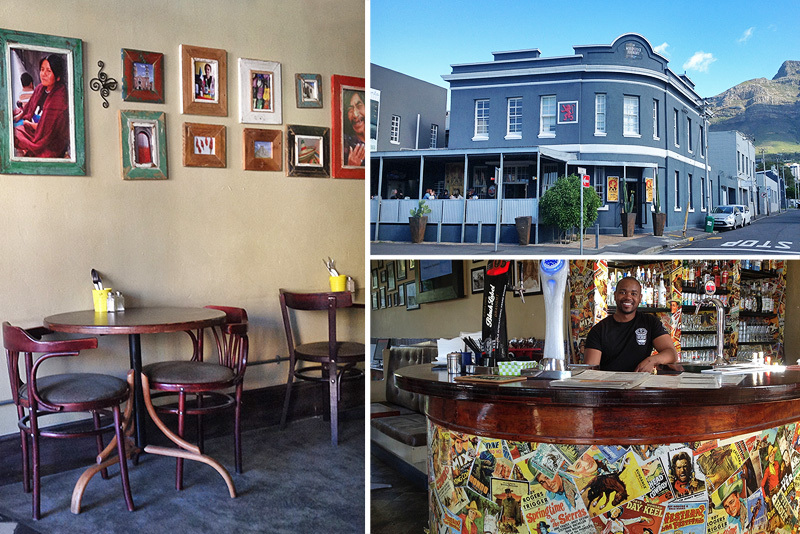 The Fat Cactus is almost a household name in Cape Town, but the branch in Albert Road is one of my favourites because I like to watch the Woodstock world go by from their verandah while enjoying an ice-cold margarita! Apart from the usual Mexican fare like tacos and quesadillas, they have a great selection of tequila, from El Jimador to Olmeca and Patron. Vegans will be pleased to know that they can also tuck into a plate of nachos as they have a non-dairy cheese option. Sangrita Tequila Bar (next door to Brewer’s Co-Op) is another great spot for a tequila as they also have a fairly wide range, including Patron, Don Julio and Centinela However, not all their tequilas listed are always in stock, so it’s best to go at the end of the week when stock should’ve arrived. The décor is charming with comfy couches and framed photos of Mexican architecture and people on the walls. I wasn’t that impressed with my Chorizo, Jalepeno and Feta Balls starter, but I did love their Tequila Mojito! Left: Sangrita’s Tequila Bar; Right: Fat Cactus in Albert Road. 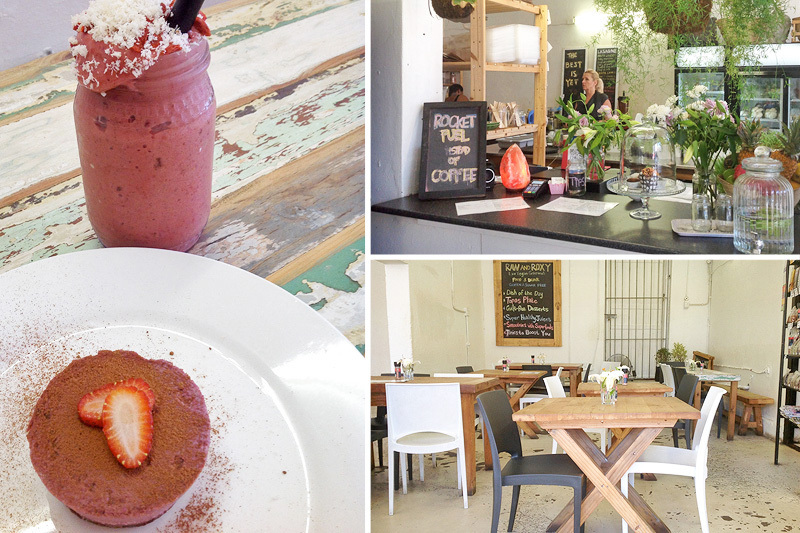 Pioneers of the raw and vegan restaurant movement in Cape Town, Raw & Roxy is a small bohemian space that also offers raw cooking lessons. The restaurant space is tiny, but everything is made with a big heart and judging by the people going in and out buying ingredients and smoothies, it’s popular with those in the know. Raw main meals include lasagne, zucchini pasta, red Thai curry, a tapas platter (so you can try a little bit of everything) and raw vegan sushi. There are also plenty of sweet treats to choose from, including a raw magnum ice-cream – raw, frozen cashew and coconut and cocoa on a stick in mint or vanilla flavour. Raw & Roxy serves up delicious vegan meals and treats that even meat-lovers will enjoy. 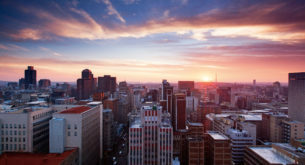 Juma Mkwela offers a Woodstock Graffiti Tour where you can see over 40 impressive works by artists such as Faith47, Jack Fox (Faith’s son), Freddy Sam (curator of the street art project), Nard-Star, Masai Lou, Spazio, Giya, Dodie Boy and Daleast (Faith’s husband) to name a few. It’s a great way to spend a fascinating two hours while taking in the neighbourhood. Woodstock is home to plenty of beautiful murals and graffiti. Saturday afternoons at Bread Café in The Bromwell Boutique Mall sees live bands crooning classic tunes while you sip on a glass of wine and spread apple & chocolate butter onto a slice of banana loaf. 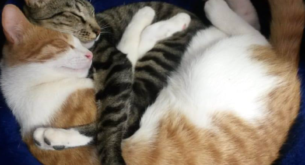 It’s lazy, languid and quite stylish without breaking the bank. 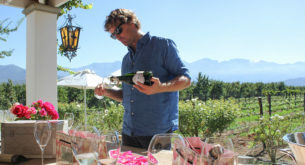 Apart from breakfasts, lunches and gourmet sandwiches, they also serve a morning tea, a champagne tea, a business tea, a luxury high tea and a late afternoon tea. On Friday afternoon you can enjoy a sundown jazz session to get you relaxed and ready for the weekend. 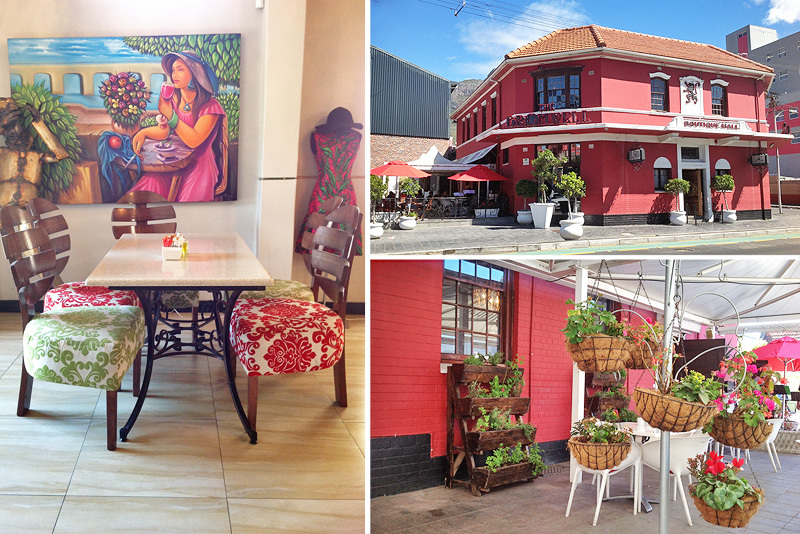 Bread Cafe at The Bromwell makes for a stylish spot to enjoy afternoon tea, or a glass or two of wine. Another one-stop community shop is the Salt Circle Arcade, housed in a bright yellow building near the Salt River Circle. There are second-hand books, shoes (including Doc Martins), eco-furniture, hand-made jewellery and eclectic items for the home and for gifts. If all that shopping makes you feel peckish, you’ll find food trucks in the courtyard serving burgers and Italian fare. Browse through books, shop for shoes and gifts and tuck into food truck fare at Salt Circle Arcade. The first thing you’ll notice about The Woodstock Exchange is how bicycle-friendly it is, with bicycle racks almost everywhere. Then you’ll notice a massive dog sculpture and a bench that’s a swing. It’s all part of the building’s creative energy, which includes a yoga and meditation studio, a tea emporium, a coffee roastery and of course, a bicycle café. There’s plenty of space outside to enjoy a cup of coffee or hang out with your mates on a Friday afternoon when they have their Live Sessions, featuring a local band with no cover charge. Not only cyclists will have a good time at The Woodstock Exchange. There’s yoga, cafes, open spaces and more. 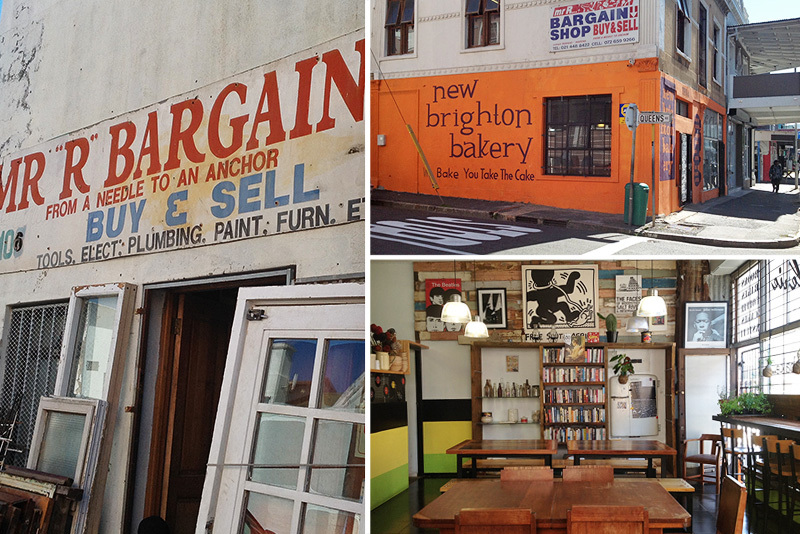 Victoria Road in Woodstock is also lined with second-hand shops and is perfect for pavement bargains, but is not quite as trendy as Albert Road. You will also have to deal with a lot of taxi traffic which can be a bit nerve-wrecking! But it’s worth it if you are wanting a real bargain! You can’t miss the bright orange building on the corner of Queen Street and Victoria Street, home to New Brighton Bakery who serve up breakfasts, various bakes (muffins, cakes, breads and cookies) and light meals (burgers, pies, sandwiches, curries, lasagne and soup). It’s a homely environment, complete with a bookshelf filled with books if you feel like reading while enjoying a cuppa. However, the tables are large and meant for sharing, so you are more likely to get chatting to interesting folk from the neighbourhood. Don’t be in a hurry though as they take their time! On your way out, pop next door to Mr R Bargain Shop where you’ll find everything from door and window frames to washers and tools. If you need anything for your home, you are very likely to find it here and at a bargain price! 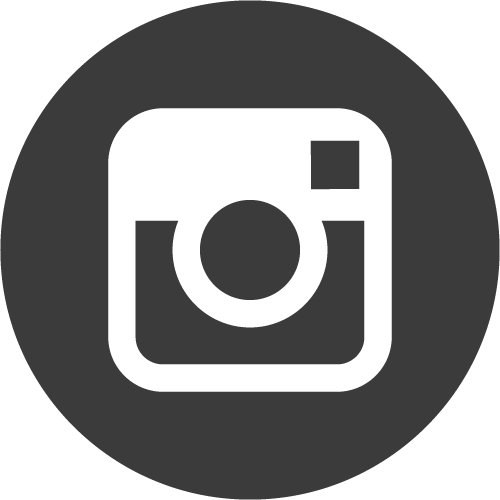 If you know of a special spot in Woodstock, let us know in the comments below!